Immigration rally near Trump Tower in New York, August 2017. All eyes will be on Donald Trump on Tuesday, as he makes his first presidential visit to Texas, where he’s expected to show his support for disaster-relief efforts and those weathering Harvey’s devastation on the ground — admirably, Houston is not in his itinerary, as the city remains underwater and will be getting even more rainfall as the week unfolds. In a break with much of his young presidency so far, this is Trump’s chance to show some modicum of leadership during a catastrophe not of his own making. Trump seems poised to kill DACA. The New York Times reported Sunday that he’s “on the brink of ending it,” and a number of factors appear to be militating against his earlier show of compassion: Jeff Sessions hates the program and thinks it’s unconstitutional; the attorney general for the very state that is now being ravaged by Harvey has threatened to sue the Trump administration over it; his base demands that he stick to his campaign pledge to mass-deport every undocumented immigrant in the country. It’s possible that Harvey’s devastation will soften Trump’s heart again. 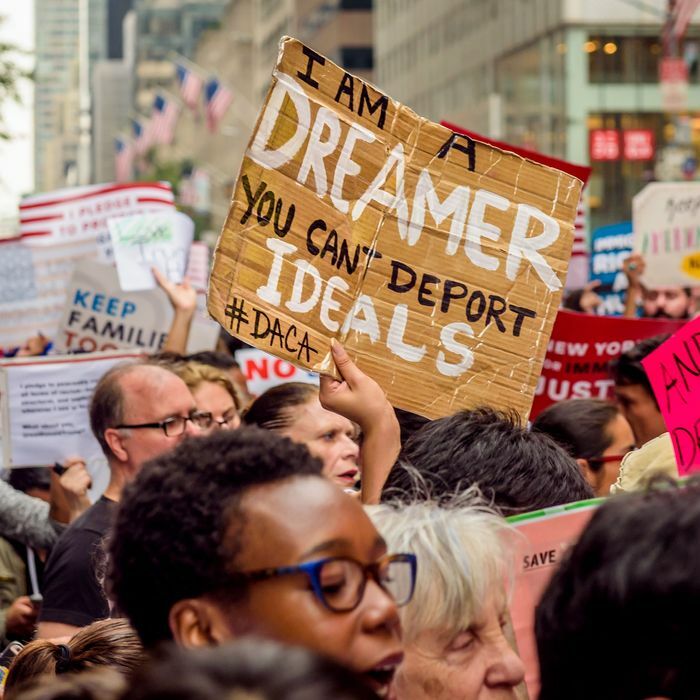 Harris County, of which Houston is the county seat, is not only the most populous in all of Texas but also the home to an estimated 68,000 youth who are DACA-eligible. Vox’s Dara Lind, who has been closely tracking the initiative’s future, has put the number of young Houstonians who have taken advantage of it at 56,800. The law is on Trump’s side when it comes to DACA. At bottom, deferring someone’s deportation and granting a temporary work permit is an exercise of prosecutorial discretion that presidents may invoke, and have invoked, for humanitarian reasons for decades. When Hurricane Katrina hit, President George W. Bush suspended the application of immigration laws that otherwise would have prevented thousands of foreign students from going to school and also granted them a temporary work permit. Other foreign students not covered by this specific grant of deferred action could still apply for it if they faced economic hardship. But the Executive branch also can’t possibly be expected, or have the resources, to deport every deportable person in sight, and so officials over the years have cited prosecutorial discretion to exercise mercy on a case-by-case basis. Sam Bernsen, a general counsel for the now-defunct Immigration and Naturalization Service — since replaced by the Department of Homeland Security — wrote a memorandum in 1975 explaining why prosecutorial discretion made sense: “The reasons for the exercise of prosecutorial discretion are both practical and humanitarian. There simply are not enough resources to enforce all of the rules and regulations that are on the books.” That memo was the building block for Obama’s later executive actions on immigration, including DACA. And yet dismantling Obama’s policy legacy may be the only reason animating Trump’s decision to end the program. In what is emerging as a clear pattern for this administration, DACA’s biggest sin in Trump’s eyes might be that Obama thought of it first. This time, of course, the move wouldn’t just be one less executive action on the books, but would also mean close to 800,000 Dreamers completely unprotected. It would inflict suffering for suffering’s sake. If that’s the route Trump chooses to go, here’s a suggestion: He should use the occasion of his Texas trip to announce DACA’s demise. And he should do it in Harris County, the place tens of thousands of Dreamers have called home since they were brought to the U.S. by their parents. Obama faced the nation when he said DACA was no more than a “temporary stopgap measure” meant to provide “a degree of relief and hope to talented, driven, patriotic young people.” Trump’s military transgender ban and his tragic pardon of Joe Arpaio both arrived in the dead of night, just as Harvey was beginning to wreak havoc in Texas. With DACA, the honorable thing for Trump to do is to own his decision in the one area where the program may be the only lifeline its young beneficiaries have left.